It would be sort of pointless to have a day devoted to The Beatles in the 2017 PopCult Gift Guide and not recommend any of their music, so we are going to suggest a gift that will please any die-hard fan who doesn’t already have it, The Beatles Sgt. Pepper Super Deluxe 4 CD/DVD/Blu Ray Box Set. To commemorate the anniversary, the Beatles authorized a very special package. The album is newly mixed by Giles Martin and engineer Sam Okell in stereo, sourced directly from the four-track masters at Abbey Road Studios in London, and guided by the original, Beatles-preferred mono mix produced by his father, George Martin. This extensive collection gives an unprecedented insight into how The Beatles made their ground-breaking album. The box set features a new stereo version by Giles Martin and 33 tracks from the Sgt. Pepper sessions that place you in the studio as the group develop the songs. I have been a Beatles fan for my entire life, and I have dwelled within the “rabid fan” catagory for nearly the last forty years. I’ve heard just about every bootleg that’s been released, and there was tons of material among the bonus tracks that I was hearing for the first time. The music includes a new stereo mix of the album by Giles Martin. Sgt. Pepper Sessions on 2 CDs with over 100 minutes of audio illustrating how the album was created. Newly mixed from the original four-track tapes, most of the material is previously unreleased. The set also contains the original 1967 mono mix of the album and bonus tracks including three previously unreleased mixes. The Blu Ray and DVD feature the fully restored 1992 documentary The Making of Sgt. Pepper, including interviews with Paul, George and Ringo and fascinating in-the-studio footage introduced by George Martin. 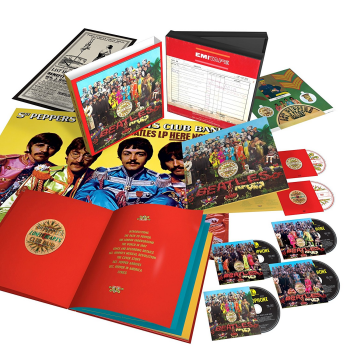 There are also restored promotional films for ‘A Day In The Life’, ‘Strawberry Fields Forever’ and ‘Penny Lane,’ a 2017 Giles Martin 5.1 surround sound mix and high-resolution stereo audio in 96KHz/24bit of Sgt. Pepper’s Lonely Hearts Club Band plus ‘Strawberry Fields Forever’ and ‘Penny Lane’. There’s more than that crammed into this box. You also get a 144-page hardback book featuring an introduction by Sir Paul McCartney, comprehensive song-by-song details and recording information, in-depth essays about the design of the cover, the album’s musical innovations and its historical context… and much more. Illustrations include photographs from the recording sessions, handwritten lyrics and Abbey Road documentation. On top of that there’s a replica of the original card insert and two bonus posters. The box is in a slipcover and includes a lenticular 3D rendition of the iconic album cover. This is a hefty set, with a price tag a bit North of a hundred bucks, but it would make a wonderful gift for the Beatlemaniac on your list. Any record store that doesn’t have it in stock can probably order it, or you can go the Amazon route.